Band of Brothers is the epic 6 disc set from Warner Brothers compiling every episode of the must watch tele-series in an attractively presented digipak. Band of Brothers tells the story of Easy Company, 506th Regiment of the 101st Airborne Division, US Army. Being part of an elite squad of paratroopers, these men were dropped in over the battlelines in Normandy on D-Day morning, fighting their way through Europe despite the horrendous odd. Easy Company suffered casualty rates of 150% and yet managed to take the Eagles Nest, Adolf Hitler's last refuge during the Second World War. 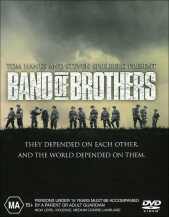 Produced by Tom Hanks and Steven Spielberg, Band of Brothers has been made in much the same style as Saving Private Ryan was, in a gritty, ultra realistic fashion. Band of Brothers does not serve to glamorise war, just tell a story based on true events told by the real men of Easy Company. The DVD looks and sounds perfect and is a must for listening to through a surround system if you have one. I believe that the series is a must own for both war aficionados and people wanting a realistic, entertaining look at the exploits of some extremely brave men during World War Two. I cannot fault this set other than the included "Message from Jeep" which I found to be in extremely poor taste and just a cruddy way to show their new vehicles. In summary I wish that someone would do the same justice to the Australian veterans. Behind the Scenes: The making of "Band of Brothers"